Holy hernias Mr. Bunny. 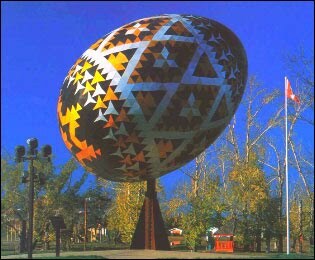 The world’s largest Easter Egg is found in Vegreville, Canada and was built in 1975 to commemorate early Ukrainian settlements there. The Pysanka is a tremendous computer modeling, engineering and architectural achievement containing 524 star patterns, 2,206 equilateral triangles, 3,512 visible facets, 6,978 nuts and bolts, and 177 internal struts. The stars symbolize life and good fortune. The three-pointed stars reference the Christian Trinity. The band that circles the egg represent eternity. The windmills are said to reference a good harvest and prosperity. Conclusion: The World’s Largest Easter Egg Weighs More than Me. This entry was posted in Uncategorized on March 31, 2010 by fatchicksings. Another weighty gem, Jeanette! Keep 'em coming!